This article studies the methods used by Chinese and foreign social science researchers in their analysis of the contents of the state and Party administration archives of the People’s Republic of China. Through the study of this particular subject, I demonstrate that the “tactics” used in the study of contemporary Chinese society may also be found in the study of totalitarian societies and to a lesser extent, in the study of modern bureaucracies. This detour via the method leads us to reconsider the question of the need for a “Sinicisation of the social sciences.” More specifically, I call into question the idea that the heuristic nature of a method is necessarily adversely affected once past the frontier. ABSTRACT: This article discusses the epistemological issues raised by the internationalisation of the social sciences as they affect the case of students from the People’s Republic of China who are trained in social sciences in France and return to pursue their career in higher education and research in China. The aim is to assess whether the epistemological differences between the two academic worlds may give rise to any professional difficulties in this many-sided scientific socialisation. Although our qualitative enquiry has revealed a number of differences, the problem of the availability of professional opportunities does not seem to have a distinctively epistemological dimension. KEYWORDS: internationalisation, social sciences, Chinese students, France, China, scientific socialisation, epistemology, higher education, research. ABSTRACT: This article describes attempts in Chinese legal scholarship to produce indigenised forms of jurisprudence. These attempts are partly animated by an ethos of anti-formalism and the assumption that Chinese legal thought and the Chinese approach to adjudication are more flexible and more responsive to social concerns than (Western) legal formalism. Interestingly, prominent currents of European and American jurisprudence have made use of similar anti-formalist arguments since the beginning of the twentieth century. The anti-formalist impulse and the calls to indigenise Chinese jurisprudence are therefore best understood as performative strategies that support specific ideological projects, such as the effort to legitimise China’s political status quo. KEYWORDS: Chinese law, legal theory. ABSTRACT: Since it was first endorsed by President Hu Jintao in 2007, ecological civilisation (EC) has developed into a central element of the green rhetoric of the Chinese Communist Party (CCP). The political promotion of EC by the Chinese leadership has been supported by a theoretical argument, according to which EC could provide an alternative development theory capable of revolutionising the ecocidal global economic order and bring about a global ecological transition. Does EC present a new theory of development enabling Chinese scholars to contribute meaningfully to the global discussion on sustainable development? What does the circulation of EC between the political and academic spheres tell us about the ability of “social sciences with Chinese characteristics” to produce innovative concepts and theories of sustainability? This article analyses what ecological civilisation brings to the study of sustainability in China as well as globally, through an analysis of the relationship between knowledge and power that has underpinned its development. 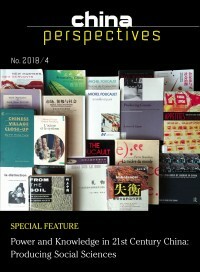 Based on a qualitative analysis of political documents and a comprehensive review of Chinese academic publications on EC, it unpacks the different layers of political and theoretical meanings that have been invested in the concept of EC over time by CCP ideologues and by scholars; and then analyses the influence that EC has had on China’s sustainability research. It argues that the political discourse of EC has increasingly limited the way in which scholars engage critically with capitalism, democracy, and other elements of green political theory. However, it also shows that many Chinese scholars, while subscribing to the EC discourse, have continued to press for the development of their disciplinary contribution to the global scientific discussion on sustainability. KEYWORDS: ecological civilisation, political discourse, Chinese social science research on ecology. ABSTRACT: This article discusses the ongoing debates about classics reading (dujing 读经) in the revitalisation and diversification of Confucian classical education in mainland China. It begins by reviewing two disputes about dujing in modern Chinese history and then turns to the contemporary debate, focusing on how one professional and experienced practitioner expounded on the disparities in practicing classical education. The author summarises three controversial issues : (1) the relationship between the educative principles and methods, (2) historical legitimacy, and (3) the linguistic nature of Chinese language. Based on these, this paper reflects on the current dujing movement by concluding that the diversification of classical education has complicated the authenticity of “Chineseness” and rendered it a debatable public issue. KEYWORDS: Confucian revival, dujing/classics reading, classical education, Chineseness. The date of 31 January 2018 marked the adoption in Hong Kong of a three-phased law banning trading in elephant ivory that will come into full effect on 31 December 2021. This article will refer to the timeline of the reform with respect to several key moments and questions that require particular attention.